Peter de Boor joined the Kennedy Center Opera House Orchestra/Washington National Opera Orchestra as Third Horn in 1997. While working towards a PhD in mathematics, he changed directions and began pursuing a career in music, at age 26. He has performed with the National Symphony Orchestra, the Orpheus Chamber Orchestra, the Richmond Symphony, the Toledo Symphony, the Windsor Symphony, and the Mexico State Symphony Orchestra (OSEM). Peter has served on the Orchestra Committee for the KCOHO since 1998, first as Treasurer, and since 2012 as Chair. He served as ICSOM delegate from 2008 to 2013, and was elected Senza Sordino Editor in 2014. Previously, he served on the Executive Board of Local 161-710 in Washington DC, from 2011 to 2014. 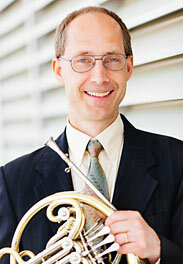 Peter received his Master of Music degree in horn performance from the University of Michigan in 1994, which was preceded by a Master of Science degree from the University of Chicago, a Master of Advanced Study from Cambridge University, and a bachelor’s degree from Princeton University (all in mathematics). In 2013 he successfully completed his first marathon, and is currently working through the third iteration of running the length of every street in Arlington Virginia, where he lives.